The Smithsonian’s National Museum of African Art is the only national museum in the United States dedicated to the collection, exhibition, conservation and study of the arts of Africa. The building houses the museum’s collection, exhibition galleries, public education facilities, an art conservation laboratory, a research library and photographic archives. The museum’s entrance pavilion is a welcoming introduction to Africa, its art, peoples and cultures. Visitors are greeted with traditional and contemporary African music, as well as a film that runs continuously. The space also is home to interactive computer stations that allow visitors to access information about museum exhibitions and programs, objects in the permanent collection and facts about Africa-related events taking place at other Smithsonian venues. Founded in l964 by Warren M. Robbins as a private educational institution, the Museum of African Art occupied a town house once owned by Frederick Douglass, a former slave, newspaper editor, abolitionist and statesman. The museum had a few examples of Douglass memorabilia, and was given a fine collection of 19th-century paintings by African American artists. The collection of African material was relatively small and so exhibitions of African art were often of loaned materials. In 1979, the Museum of African Art became part of the Smithsonian Institution following an Act of Congress, and in 1981 it was officially renamed the National Museum of African Art. In 1983, Sylvia H. Williams and Roy Sieber joined the museum as director and associate director for research and collections, respectively. Plans were made for a new facility on the National Mall that would be accessible to a new and larger audience, and in 1987, under the leadership of Williams, the museum was relocated to its current facility at 950 Independence Ave. S.W. The museum’s collection of nearly 12,000 African Art objects represents nearly every area of the continent of Africa and contains a variety of media and art forms—textiles, photography, sculpture, pottery, painting and jewelry and video art—dating from ancient to contemporary times. Through the generosity of African art collectors, the museum receives more than 60 gifts per year. The museum has the largest publicly held collection of contemporary African art in the United States. The museum has nearly 22,000 square feet of exhibition space, which is reconfigured periodically to meet the requirements of the museum’s changing exhibitions. The Sylvia H. Williams Gallery, located on sub-level one, is devoted primarily to contemporary art; the Walt Disney-Tishman African Art Collection will have a dedicated space in the museum to rotate a selection of the 525 objects from this collection; the remaining galleries offer exhibitions on various subjects. Visionary: Viewpoints on Africa’s Arts—ongoing. Jim Chuchu’s Invocations—through July 2018. The National Museum of African Art offers a variety of educational programs, including lectures, public discussions, films, storytelling, musical performances, young people’s workshops, teacher’s workshops, and conservation and curatorial clinics. The museum also has programs and activities at Washington, D.C., area schools and African embassies. The Warren M. Robbins Library, named for the museum’s founder, is a branch of the Smithsonian Institution Libraries system and supports research, exhibitions and public programs of the museum. It is the major resource center in the world for the research and study of the visual arts of Africa, and houses more than 32,000 volumes on African art, history and culture. It is open to scholars and the general public by appointment Monday through Friday. The museum also houses the Eliot Elisofon Photographic Archives, named for the famed Life magazine photographer. Elisofon’s association with the National Museum of African Art began as a founding trustee in 1964. Upon his death in 1973, he donated his African-related materials to the museum, including more than 50,000 black-and-white negatives and photographs, 30,000 color slides and 120,000 feet of motion picture film and sound materials. The bequest became the foundation for the Eliot Elisofon Photographic Archives. Since 1973, the archives holdings have grown to include more than 180,000 slides and color transparencies and 80,000 black-and-white photographs. In addition to the collection of Eliot Elisofon, major collections include approximately 5,000 black-and-white photographs taken by Constance Stuart Larrabee in South Africa between 1936 and 1983, more than 10,000 slides depicting Yoruba art and culture by Henry Drewal and Margaret Thompson Drewal and a historical collection of about 13,000 postcards. Special collections include late 19th- and early 20th-century photographic albums with significant anthropological and historical research value. The museum’s Conservation Department is dedicated to the long-term preservation of art and other cultural property from the entire continent of Africa and is responsible for the examination, documentation, preventative care, treatment and restoration of these materials. The museum houses a state-of-the-art conservation laboratory and continues to refine conservation procedures unique to the care of African art. Conservation activities are integrated into every aspect of the museum’s operation. These activities include documenting the condition of all collection objects, treating objects, assessing the condition and previous restoration of potential acquisitions, maintaining optimal exhibition/storage conditions for preserving artifacts, executing collections-based research, conducting educational tours of the lab and preparing interns for formal conservation training. The museum’s award-winning website (africa.si.edu), which offers more than 30 virtual versions of exhibitions and receives more than 1 million Web visits each year, is a recognized leader in providing educational services. Recently designated as one of the best educational museum websites by the National Endowment for the Humanities, africa.si.edu provides scholarly information through the collections database, general museum information and online calendar. The museum publishes catalogs of its collections and exhibitions. In addition, staff regularly publish and contribute articles and papers to subject-related publications. The most recent publications are Fragile Legacies, Earth Matters: Land as Material and Metaphor in the Arts of Africa and Visions of the Forests: The Art of Liberia and Sierra Leone. 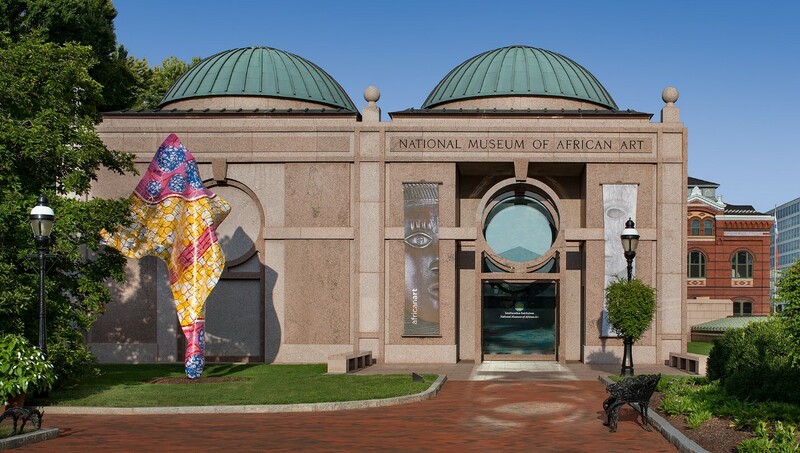 The National Museum of African Art is open daily from 10 a.m. to 5:30 p.m., closed Dec. 25. Admission is free. The museum is located at 950 Independence Avenue S.W., near the Smithsonian Metrorail station on the Blue and Orange lines. For more information, call (202) 633-4600 or visit the museum’s website at africa.si.edu. For general Smithsonian information, call (202) 633-1000. All entrances and restrooms to the museum are accessible. Elevators provide access to all levels of the museum. There is a public TTY on level one, near the museum store. The museum’s exhibition materials are available in audiocassette, computer disk, Braille and large-print formats at the information desk in the pavilion. Sign-language, oral and cued-speech interpreters are available on request for docent-led tours or public programs. Smithsonian's National Museum of African Art in Washington, D.C.